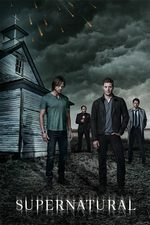 Sam and Dean must stop Rowena, who is on a deadly mission. Meanwhile, Castiel reaches out to the heaven for help and gets a surprise. Whooooa, I know all the magical lore flies over my head sometimes, but what the hell did Sam let Rowena unlock that gives her the power to kill reapers?? Also, I almost forgot about Billie/Death and the books about Dean's death. I guess they're finally using that to set up the next season, with fate being out of wack and stuff. I knew angels were dying left and right, but I didn't realize they were really going extinct that fast! a total of 9?? And the guard Indra wants to die? Wow so when they're not being dicks they're whimpering cowards. It wasn't clear to me in the last episode the Lucifer left after failing to be "God", but it was a surprise that Naomi is back. It wasn't clear to me in the last episode the Lucifer left after failing to be "God", but it was a surprise that Naomi is back. Yeah, I was also really surprised by the lack of Lucifer in heaven. I didn't realize he bailed. And also, only nine angels left? I knew it was never going to happen, but when I realized Rowena was trying to bring back Crowley, I was really hoping we would see his return. Not surprised it didn't happen. I didn't mind Naomi as a character, but it did seem kind of weird to bring her back, especially since it's hard to think of a really compelling reason for her return. It just seems like with apocalypse world Bobby, Charlie, and Kevin Tran returning, plus Gabriel coming back, not to mention Ketch, Rowena, and of course Cas, maybe we've had enough resurrections/returns for one season? I mean, I know this show is always bringing people back, but it's starting to feel a little excessive, even by this show's standard. what the hell did Sam let Rowena unlock that gives her the power to kill reapers?? This was awhile ago, but wasn't it something about the Grand Coven putting a binding spell on a her more extreme magic? Or maybe I made that up? But yeah, witches have never really made a lot of sense in this show. I kind of wish they had stuck with the first type of witches we saw (the ones who had to borrow power from a demon to do spell work). I was half expecting Atropos to show up at some point, they kept talking about how Rowena was changing fate etc. which is close to exactly what they were discussing after Balthazar saved the Titanic in S6. I guess it's easier to use Billie instead, because she is a more current character. Naomi is kind of a strange choice, I don't think she was terrible, but never super interesting either. Maybe it's some kind of deception by Lucifer? After the angels kept disappearing into the backroom I thought they were setting up the Lucifer reveal. Waiting for the Shedim to make a reappearance, although now that Asmodeus is gone that's probably on the long term backburner, and perhaps for Prime Universe Michael to show up as has been teased IRL. A good episode, but Lucifer just being gone from heaven seemed like too much of story jump. I'm guessing the angels are subjecting him to some sort of unpleasantness in that backroom they kept visiting. With that line about how "everything ends," I had the feeling there was a bit of meta-commentary there. Also, the thing about how Sam will inevitably be the one who kills Rowena, that seemed like another set-up for some final season stuff. The show feels like it could just go and go, but it can't. I know they've already been renewed for another season, but I imagine the folks behind the scenes have got to be thinking about an endgame here. If they're actually planning a season where all of the dead souls EVER come back to Earth, that seems a little too ambitious for this show. I mean, the world would be overrun with countless billions of ghosts! I'd kind of like to see it, but it'd transform the show completely if the world suddenly had more ghosts than living people. You can't really do MOW episodes with something like that going on. They got more pathos out of Rowena than I was expecting. Her relationship with Crowley was always so twisted, but you did get the feeling she did care about him on some level. (He never really seemed to like her even a little bit, though.) She seems to be in the good-ish camp, at least for now. I suspect we will see Crowley again at some point, even if Mark Shepherd has been adamant that we never will. Yeah, but if all the ghosts come back we can bring back ALL the dead folks! One of the reasons it's too bad Rowena didn't bring Crowley back is because it'd be fun to see how he'd react to her doing such a loving, altruistic act on his behalf. I'm guessing he'd insist she had an ulterior motive, or he'd resent her for it and feel like it was too little, too late. However he reacted, you KNOW there would have just been more drama and snarking between them. I for one would love to see Bela Talbot again (and Lauren Cohan can use her natural British accent! ), but I suppose it'd be an alternate dimension one, since she's in hell, and hopefully that version didn't make a crossroads deal either. Also, maybe Sam finally ends up with Amelia? She technically chose him over her husband even though Sam decided for her. I was thinking the other day that they've really dialed back the MOW episodes, or at least they do a lot better at kind of folding them into the larger stories. Not so long ago they used to awkwardly say, "Well, we're not making any progress finding that artifact that will save the world, so let's go out on a case!" The MOW episodes came to feel like a definite detour from the big arcs. But now it seems like it's mostly the big arcs, and if they do a MOW it's usually tied into the arc somehow. It seems like a long time since they just went and hunted for hunting's sake. Heh technically Scoobynatural was a MOW, and that was only 3 episodes ago. And it was definitely a case of "while we're sitting here waiting on Cas with that spell ingredient here's a weird thing to check out"
Fair point, but that seemed like less of a MOW and more of an "event" episode. It felt like they were specifically minimizing all of the arc stuff as much as possible in that one because they knew they would be getting a lot of new viewers. It really felt like an outlier.